When I was scheduling the posts over the coming months, I hadn’t planned to write about this topic, however, this keeps coming up and I think it’s important to look at. Specifically lots of people have asked should I (or my patients) train to fatigue? Fatigue or Failure, What Does it Matter? It matters because it comes back to being specific about your outcomes and goals again. 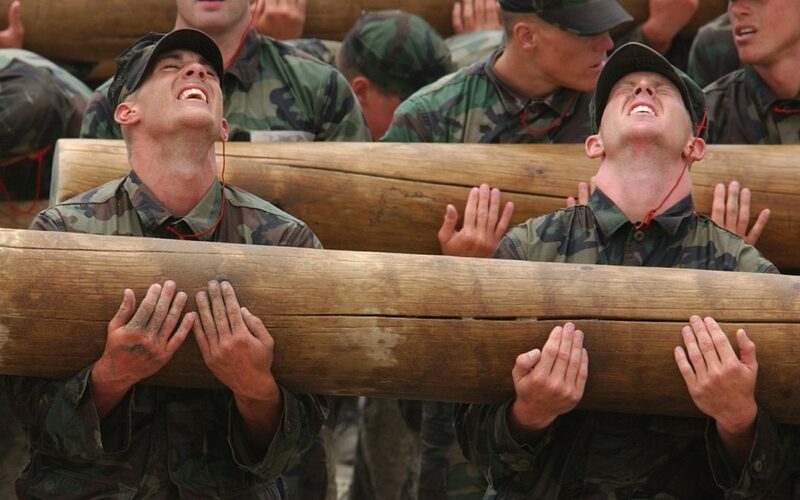 Fatigue and failure aren’t necessarily the same thing. Also it can matter from a communication perspective and how you instruct patients on their exercise programme. i.e. a measurable reduction in muscle strength, assessed via a maximal voluntary contraction (e.g 1,2,3) and that’s been important for my application. However, others have chosen task failure – the inability to maintain a sub-maximal contraction for a period of time (4), time to exhaustion during maximal lactate steady-state cycling exercise (5)…and then there are subjective measures of fatigue. Really, we could go on and on. Type “muscle fatigue” into Pubmed and there are 19736 hits! Here’s just an example of a study (Alhammoud et al. 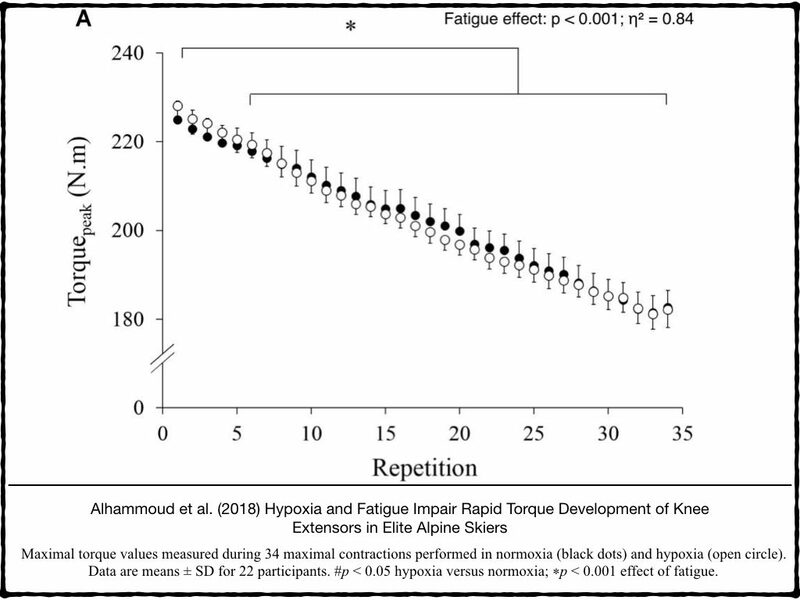 2018) that investigated the effect of hypoxia and fatigue on rate of torque development in Alpine Skiers. You can see they clearly induced fatigue, as identified by a continually reduced force output across the 35 maximal isokinetic contractions. Open access full text available here. The prevailing mechanisms of muscle fatigue depend on the exercise, and this in turn will determine the period of time required to recover. Broadly speaking, in strength-based training, the efforts are very high intensity, short in duration and require a relatively short time frame for recovery. Conversely, in more endurance-type exercise, the effort is sub-maximal, the duration is longer and the time frame for recovery can be longer, depending on what you’re measuring. There’s a lot to cover here; what we’re trying to ascertain is the carry-over effects of a prior episode of exercise on the next and how to mitigate its deleterious effects on training and adaptation. As such I’ll be focussing on this in a separate post, however, in brief 1.5 to 2 minutes should be enough to recover from a set of 3-5RM strength exercise. That doesn’t mean you or your patient/client has to sit around doing nothing, to save precious time, they can exercise another muscle group – not involved in the prior exercise. For example perform a set of shoulder press or calf raises following a set of knee extensions. If we put aside the physiologic discussion of fatigue for a moment and focus on the application, I think the terminology is important in one’s instruction to patients/clients. Within a strength context I want someone to to work really hard for a short period of time, in fact here I want them to achieve a 5RM (repetition maximum). I need to find a way to communicate that to the person. I find the term ‘fatigue’ is understood by most to mean ‘tired’, ‘lack of energy’, maybe if they’re familiar with resistance exercise, a ‘burning feeling in the muscles’ (completely anecdotal account here by the way!). So if we set the resistance exercise to cease when any of these markers are reached, it’s not doing what I want it to do, we probably won’t be at a 5RM. Either the resistance will be too low, and, or, they will stop prematurely. A burning sensation within the muscles is due to acidosis and will likely be felt at a rep range of >5RM. Experiencing the sensations of tiredness and having a lack of energy, again, is more associated with prolonged, endurance-type exercise, and is not what I’m trying to achieve. Hence, I find the term ‘failure’ much more useful. Communicating to patients/clients something like “Select a weight that you can maximally lift 5 times, but fail to [correctly] lift 6 times.” (in a safe environment and with correct technique, obviously) can really help to distinguish this type of exercise from any other that they’ve done before, and focus your intervention appropriately. Another reason for not being a fan of using the term fatigue is that for me it’s a externally measured outcome resulting from the training loads or the exercise stress imposed (as seen in the figure above). Thus it might be represented by a % reduction in muscle force or a % increase in time to completion of an agility task etc. It can also be confused with exercise-induced muscle damage, which is characterised by that sore feeling (DOMS) experienced a day to two days following novel exercise. Maybe I’m being unnecessarily fastidious, but, clarity is important, whether that be in academic publishing or instructing a patient on their rehabilitation exercise. So for me, to use the term failure avoids any confusion with physiologic outcome measures of loss of performance and it provides potentially a more meaningful instruction to the patient/client. Minshull & James (2013). The effects of hypohydration and fatigue on neuromuscular activation performance. Applied Physiology, Nutrition and Metabolism 38: 21–26. Paasuke et al. (2007) Changes in soleus motoneuron pool reflex excitability and surface EMG parameters during fatiguing low- vs. high-intensity isometric contractions. J Electromyogr Kinesiol. 21(4):672-677. Faude et al (2017). Reliability of time to exhaustion and selected psycho-physiological variables during constant-load cycling at the maximal lactate steady-state. Appl Physiol Nutr Metab. 42(2):142-147.